Natural Gas Pipeline Safety: A Crisis or a Manageable Issue? San Bruno, Calif.; Allentown, Pa.; Sissonville, W.V. ; Cleburne, Texas. Listening to the media coverage on towns impacted by natural gas disasters, it seems believable that the 230,000 miles of gathering lines, 300,000 miles of transmission lines, and 2 million miles of distribution lines that comprise the U.S. natural gas pipeline system are an underground menace waiting to explode. Should we all be living in fear of getting caught in the next explosion? What can be done about the risks? Assuming something can be done about risks, what barriers are keeping steps from being taken? A deeper look at answers to these important questions follows. Should we all live in fear? In short, no. Statistically, pipeline transportation is significantly safer than either automobile travel or air travel. Annual deaths due to pipeline explosions are dramatically lower than deaths due to other common transport accidents including automobile, rail, and air. Data collected by ProPublica indicate that pipeline incidents have decreased in the last decade. Regardless, even a few deaths a year are too many, and operators of pipelines must grapple with how to make their infrastructure safer. Executives of these companies have heard the news; in recent surveys of what worries natural gas executives the most, safety always comes at or near the top. So what can be done about pipeline accidents? First we must understand why pipeline accidents occur. 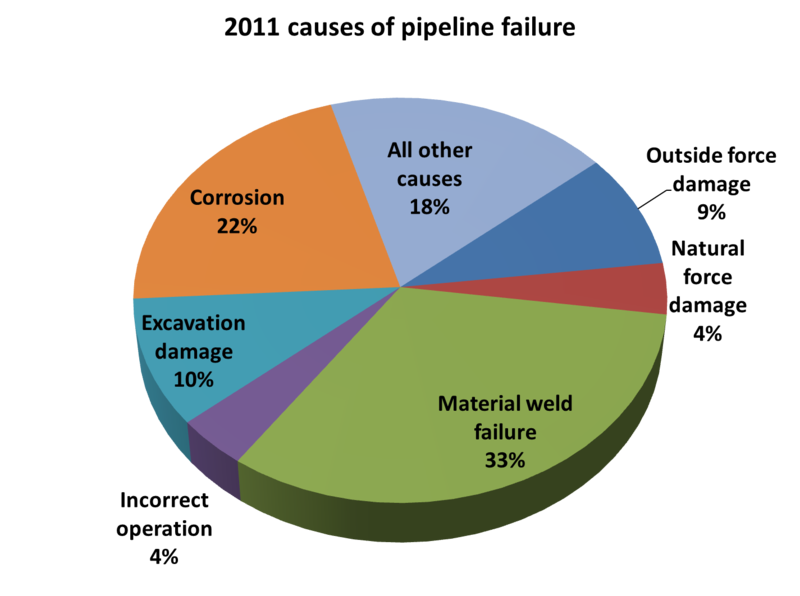 Key factors resulting in pipeline accidents include weld failures, corrosion, excavation damage, and outside force damage. Excavation and outside force damage will never be 100% preventable, but it can be reduced through clearly marking pipelines as well as through educating the public and those involved in the construction trades. Greater difficulty is involved in reducing incidents due to pipe corrosion and historic bad welds long-buried underground and left unidentified until pipes fail. These require expensive testing, and when a problem is identified they require expensive pipeline replacement. Many older pipes were not built to allow for in-pipe testing through use of a device called a pig. This means that if testing is to occur, pipes must be excavated or expensive retrofitting or other specialized techniques must be used. And testing often requires a large segment of customers be taken out of service while testing occurs. In many cases today, operators receive only limited operational data from their pipelines and require field crews to be dispatched to operate valves and other equipment. What is impeding rapid implementation of safety improvements? From an operational standpoint pipelines need first to improve data and information on exactly what they have in the field. It sounds strange to the general public, but since many pipelines have been in the ground for 50 years or more, data on pipeline conditions and even exactly what was exists underground may be lacking. So before major improvement initiatives can be planned, pipelines must work to improve their asset knowledge. This takes time and is expensive, so pipelines prioritize and first inventory pipe in high-consequence areas. Testing of pipelines also takes lots of time, is expensive, and can result in customer outages. Simply upgrading asset knowledge and testing can run in the hundreds of millions of dollars for a pipeline system. Lastly, once conditions are known, pipelines must decide where to best spend dollars to upgrade pipeline safety characteristics. Pipelines use analysis of conditions, threats, and potential consequences to evaluate risks for specific sections of their system. Then pipelines must develop mitigation strategies to address the high-risk areas. This too is expensive. PG&E, for instance, has spent $2 billion+ in safety upgrades to its system since the San Bruno incident. One last obstacle is the lack of trained personnel available to handle the projects identified and approved. In fact, almost all pipelines are staffed by numerous employees reaching retirement age. Most pipelines are destined to lose over half their experienced workforce in the next five to 10 years. Pipeline companies must hire and train numerous new employees at the same time that major new safety initiatives need implemented. So while pipeline risk cannot be fully eliminated, it can be mitigated. This takes a lot of money, which leads to the question: Who pays for this? Often the media and public blame the pipeline companies and suggest their shareholders must carry the burden. But this answer does not reflect the reality of how the pipeline business is regulated and how costs are borne. As long as pipeline owners have prudently followed their regulatory mandates, the form of regulation used in the U.S. says that pipelines are allowed to pass their costs of doing business on to customers. In fact, most pipelines’ and utilities’ profits are not tied to cutting costs but rather are based on a return on investment in capital facilities. So unless the pipelines can be proven negligent or imprudent, new pipelines’ expenses to cover safety upgrades are going to be paid by consumers not shareholders. This leaves regulators with an uncomfortable decision to make: They get to decide just how much of consumers’ money should be used for safety upgrades. This is a question that regulators across the U.S. will deal with in the coming years. In the meantime, the gas pipeline owners will be working diligently to implement improved safety measures while hoping their systems are not the next to make the news. Enerdynamics has recently partnered with a major gas pipeline/utility company to develop Gas System Fundamentals training programs to facilitate rapid in-boarding of new field force and engineering employees. If you are interested in learning more about what we’ve developed, please contact us at 1-866-765-5432. This entry was posted in Natural Gas and tagged List of pipeline accidents, Pacific Gas and Electric Company, Pipeline transport, ProPublica, San Bruno California, Sissonville, Sissonville West Virginia, United States. Bookmark the permalink. 1 Response to Natural Gas Pipeline Safety: A Crisis or a Manageable Issue?